You cannot add "HF020 20mm S-Clasp" to the cart because the product is out of stock. Approx. 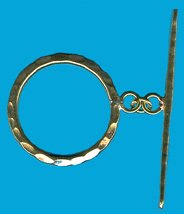 20mm x 12mm, 9mm Rings. Stated price is based on 3.2 grams. Handmade of ~95+% silver by Karen Hilltribe silversmiths in Northern Thailand. Due to the handmade nature of these beads; size, weight and design may vary. Click here for larger image.